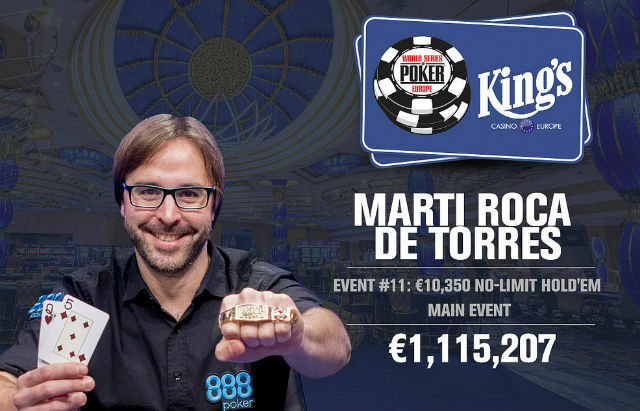 Former economics teacher turned poker professional, Marti Roca De Torres, outlasted the 529 runners and marathon final table to become the World Series of Poker Europe Main Event Champion, taking home his first WSOP bracelet and a massive €1,115,207 ($1,297,552) first place prize. Roca De Torres’ “dream come true” was made in part by winning his way into the €10,350 Main Event through a €220 satellite on 888poker. From there the Spaniard seized the opportunity, showed incredible resolve, and grinded his way through a grueling final table to end up with a career score that will be tough to top. After the elimination of Stepan Osinovski in ninth place on Day 5 the official final table of eight players was set to begin. The remaining field included popular UK pro Jack Salter, live poker Triple Crown winner Niall Farrelland one of the most recognizable names in poker, Maria Ho, holding the chip lead and looking for her first World Series of Poker bracelet. Just after the dinner break, on the 10th hand of the official final table, Spaniard Luis Rodriguez, having had his stack crippled on a previous hand, was forced to push his remaining four big blinds in holding . Farrell, holding , reshoved, isolating the short stack. The board came clean for the aces, , and Rodriguez walked with €97,344. Roughly 30 minutes later, a classic flip helped decide the fate of Jack Salter. With similar sized stacks, Salter and Gianluca Speranza would find themselves all in. Salter, covering Speranza, had the slightest of leads holding against the Italian’s . The flop put Speranza in great position to double through. Salter would get no help from the turn or river, leaving him with just a few blinds to try and grind back. The very next hand would be the end of Salter as his shipped would fall to Roca De Torres’ . Salter books a €129,121 cash in seventh place, his second six-figure score of the week after min-cashing the €111,111 High Roller For One Drop earlier in the series. With Salter’s exit, play was suspended for the night. The remaining six returned on Saturday for Day 6 to play down to a winner with Maria Ho still in the chip lead. Unfortunately for Ho, after running hot and playing well over the course of five days, her fortunes changed dramatically on the final day. A couple of key hands made major dents in her chip lead, including a hand in which she shipped from the big blind against a Niall Farrell open raise. He snapped with , which held, and allowed him to double up and Ho to sink down to the bottom of the chip counts. While this seemed to send Farrell and Ho’s future at the table in opposite directions, the fate of both would be decided just ten hands later. The short-stacked Ho, open shipped roughly 10 big blinds, holding . The largest stack at the table, now belonging Roca De Torres, made the call in the small blind. Farrell, second in chips and in the big blind, peered down at . Farrell reshipped. Roca De Torres snapped. Both Farrell and Ho saw the bad news as the online qualifier tabled for a three-way set-up hand. No one improved as the innocuous board of gave Roca De Torres the double knockout and a massive chipl ead with four remaining. Ho and Farrell, the two most prominent players of the final table were eliminated on the same hand. Ho took home €174,365 in sixth and Farrell finished in fifth for €239,639, just shy of his second WSOP bracelet. Play evened out four-handed and Roca De Torres lost multiple bids to knock out his fellow competitors as his stack fall back to the pack. Hours passed with all four men jockeying for position. Then, finally, over 80 hands later, the next elimination would take place. Finding himself short once again, after being at the bottom of the chip counts for much of the final table, the UK’s Robert Bickley made his last stand by shipping his from the small blind. Mathijs Jonkers quickly called showing down the . Bickley, behind but with two live cards, found no help on the flop of . When the fell on the turn, it looked like Bickley would survive his seventh all in of the final table. But with spades and two overs as river outs, Jonkers ended Bickley’s gritty run when the completed the board. Bickley finished in fourth for €335,089. After a short break, Jonkers own time would come. Speranza, holding a commanding chip lead at this point, put in a raise with , Jonkers, who had folded a suited ace to him in the big blind just a few hands prior, decided that he could not fold a second time. Jonkers put in a re-raise with a dominated , effectively committing his short stack to the hand. Speranza put Jonkers all in and the Dutchman placed his few remaining chips in the middle. After seeing the situation, Jonkers began to beg for a seven to keep his dream alive. The flop of not only didn’t provide any help to Jonkers, but it pulled an out away. When the dropped on the turn, Jonkers, drawing dead, tapped the table, congratulated his fellow competitors and moved to his rail for comfort, collecting €476,585 for his efforts. Nine and a half hours after the six-handed final table started, heads-up play began between Speranza and Roca De Torres. Speranza began the heads-up battle holding the chip lead, but the tides turned in favor of the Roca De Torres as what looked like could be a quick finish turned into a four-hour heads-up battle. The final hand came down to, essentially, a coin flip, as the pair were nearly equal in chips when Roca De Torres shoved with the almighty and Speranza called hoping to close it out called with two overs, . The [ah[p9d] put the Italian way in front but the turn sealed the deal for Roca De Torres and the completed the board. Speranza, with less than two blinds left, stuck it in with the very next hand. Roca De Torres’ held as the final board of the tournament read . Speranza’s consolation prize is a hefty €689,246 while Roca De Torres, who won his way into the tournament for €220, wins €1,115,207 and the World Series of Poker Europe Main Event gold bracelet.